Erected 1928 by N.Y. Stare Historical Marker. Location. 42° 51.837′ N, 74° 40.399′ W. Marker is near Sprout Brook, New York, in Montgomery County. 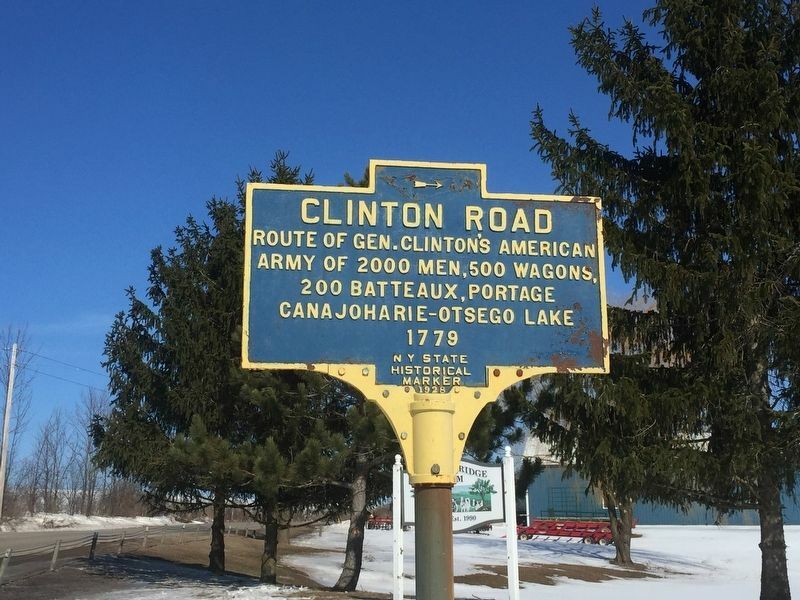 Marker is on Clinton Road (County Route 80), on the left when traveling south. Touch for map. Marker is in this post office area: Canajoharie NY 13317, United States of America. Touch for directions. Other nearby markers. At least 8 other markers are within 6 miles of this marker, measured as the crow flies. Flint Homesite (approx. one mile away); Henry Seeber (approx. 1.8 miles away); Indian Trail & Military Road (approx. 3.1 miles away); Christopher P. Yates (approx. 3.6 miles away); Ancient Salt Springs (approx. 3.7 miles away); Lieutenant Wormuth Killed (approx. 4.1 miles away); James Mereness (approx. 4.2 miles away); Fort Plain Free Library (approx. 5.4 miles away). More. Search the internet for Clinton Road. Credits. This page was last revised on March 11, 2019. This page originally submitted on March 9, 2019, by Steve Stoessel of Niskayuna, New York. This page has been viewed 80 times since then. Photo 1. submitted on March 9, 2019, by Steve Stoessel of Niskayuna, New York. • Bill Pfingsten was the editor who published this page.